Compares to similar units OVER $3000! 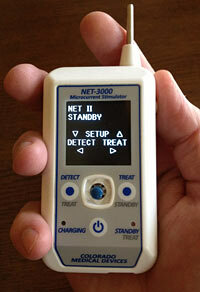 Acupuncture Medical Arts LLC is pleased to present the newest generation of the NET-3000 neuro-electric stimulator. Designed by the creator of the NET-I, NET-II and NET-2000 auricular devices, this truly remarkable device will offer all of the advantages of the previous models for auricular therapy detection and stimulation with enhanced features to make your work even better! The NET-3000 has an enhanced LED display to guide the practitioner through the device's functions, micro-current stimulation, a new enhanced rechargeable battery, a supple retractable bi-polar probe to detect and treat, an automatic timer and safety, and a remarkably compact hand-held design. Thus, the NET-3000 will provide you with all of the advantages that the previous generations offered, including automatic stimulation of all of the 7 Nogier frequencies. This is truly the most sophisticated auricular detection and treatment device available! Compare to other devices that provide less features at more than $3000!! The NET-3000 offers truly spectacular value and multiple features for only $1,650.00 + S&H. LESS Comparable units cost OVER $3,000!